Kamille Filoteo, probably the most-hated housemate of Pinoy Big Brother PBB 737, has been declared SAFE from eviction, along with Zonia Mejia and Ylona Garcia. During earlier's 3rd Eviction Night, gay housemate Ryan Bacalla from Cebu has been evicted from the Pinoy Big Brother house, after getting the lowest number of votes among the 4 nominees for eviction. He only got 14.63% of the votes. During last week's eviction, when Ailah Antopina was evicted, Ryan got the 2nd lowest percentage of votes, an indication that his fellow Cebuanos weren't that ardent in voting for him, which is kinda rare since Cebu has produced 3 Pinoy Big Brother Big Winners (Kim Chiu, Keanna Reeves and Slater Young) and also 4 runners-up (Paul Jake Castillo, Nicole Uysiuseng, Fretzie Bercede and Devon Seron). Ryan also represented the LGBT community in the house, and obviously, their support was not that strong to save him from eviction and beat the female nominees. Getting the highest number of votes among the 4 nominees was the lovely Zonia Mejia, with 32.16%, followed by Ylona Garcia, with 28.35%. Zonia also got higher votes than Ylona during last week's eviction, though they're both behind Bailey May. 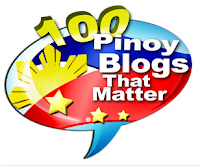 Bashers and haters of Teen Mama Kamille Filoteo were unsuccessful in their campaign to have her evicted from the house. The teen mother got 24.86%. I think Kamille is Tricia Santos or Karen Reyes of the season, but not as "strong" as the 2 in the public votes. Tricia and Karen usually topped in the voting during eviction, and were able to survive more than 3 evictions. Will Kamille stay 'til the end? She got many haters primarily because of her extra sweetness and closeness with Kenzo Gutierrez despite having a boyfriend, the father of her baby, waiting outside of the house. 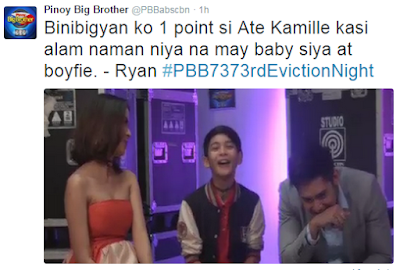 This probably is what Ryan has in mind as well when he said this during his PBB 737 Online interview after eviction: "Binibigyan ko 1 point si Ate Kamille kasi alam naman niya na may baby siya at boyfie. Kasi yung mga nangyayari sa kanila ni Kenzo... may cuddling!" Meanwhile, tomorrow, July 18, is the 4th Nomination Night, with a new nomination process once again. After winning the PINASaya challenge, housemates Zonia, Franco Rodriguez and Jimboy Martin were already declared SAFE from being nominated. 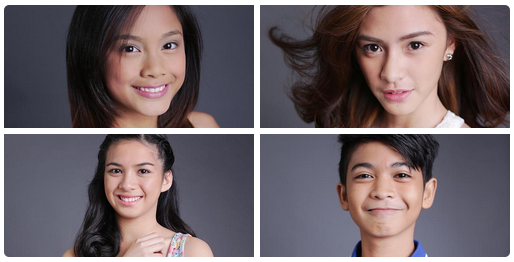 Therefore, the next set of nominees will only come from Kamille, Ylona, Kenzo, Bailey and Kyle. Who do you think are the next nominated housemates? It was shown in the last part of PBB's episode earlier that Enchong Dee is back inside the house to live with the housemates. Now I hope the live stream will also be back, especially now that it's the last 3 weeks of the current set of housemates. As announced, it's already the last 3 weeks for the teen housemates, and netizens speculate that a new batch of housemates might soon enter the house to join the 4 who will be left among the currrent in-house teens.